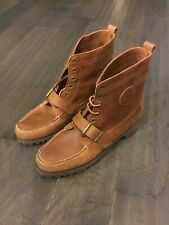 Ralph Lauren Polo boots Size 12. New. No box. Authentic. Quality. Pictures tell the story. Will not ship outside of the United States. Will ship immediately after verification of payment. Shipped with USPS Priority Mail. No returns accepted. Thank you for looking at our listing. 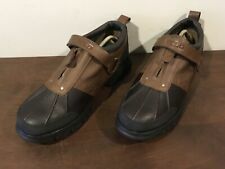 Ralph Lauren Polo Mens 100%Leather Brown Waterbury Chelsea Boots Sz 12 D US. Condition is Pre-owned. Shipped with USPS Priority Mail Medium Flat Rate Box. DARK BROWN LEATHER VERY SHINNY AND NEW NO WEAR. THEY GO UP TO THE ANKLE. THEY ZIP ON THE SIDES AND HAVE A STRAP WITH A BRASS RING.WITH SOFT PLAID BAL MAN MADE MATERIAL INSIDE. OTHER THAN THAT THESE POLO BOOTS ARE IN PERFECT MINT CONDITION. You will look good in these ralph lauren boots. 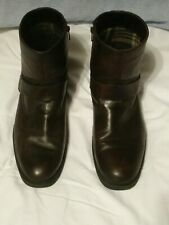 These authentic Ralph Lauren Leather boots scream of quality. Designed & built to last a lifetime. Originally purchased from a RL store for $699 and used in our window display. Now lucky buyer will get an awesome deal. Boots are authentic and never worn. Only placed in window on mannequin. Please check pictures carefully and ask any questions. We do NOT accept returns. Will ship immediately after verification of payment. Will not ship outside of the United States. Thank you for looking at our listing. Ralph Lauren Polo Tedd “Distressed” Leather Tan Snuff Boot Men’s 12D Rare. 99% used Condition is Pre-owned. Shipped with USPS Priority Mail. Look at the heels very good condition. Condition is Pre-owned. See photos. Very Cool. Size 12 see pics for condition. From 1992/1993. Impossible to find in unworn condition let alone with the original box and tissue paper. See pics for condition. I am an avid collector of Ranger boots and Ranger Shoes. In the last 17 years I haven’t seen another new in the box original edition.